My first experience with chocolate avocado mousse tasted more like mashed avocado with a little cocoa powder mixed in. After that, I thought that turning avocado into dessert was impossible. Yet, for some unknown reason, I kept trying. And I finally did it! 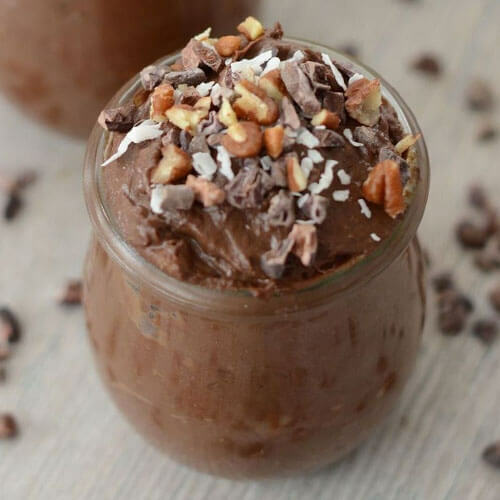 This decadent chocolate avocado mousse is here to prove that sweet treats can be indulgent and healthy! It's satisfying, refined sugar-free, and not overly sweet. Full of healthy fats and antioxidant-rich cacao powder, this mousse also includes chia seeds and collagen for a nutritional boost. My husband, who does not usually eat dessert and is super sensitive to anything remotely sweet, actually likes this chocolate avocado mousse. That means it truly isn’t too sweet! So, you have my (and his) word for it. This recipe requires a food processor. It could be made in a blender if you don’t have access to a food processor, but more liquid is needed to get everything to blend. Feel free to sweeten to taste. If you find the dessert is not sweet enough, add maple syrup, honey, or stevia to your liking. Either of these options could be stirred in at the end after you’ve had a chance to taste it. Just be sure to add a little at a time so as not to make it too sweet. Also note that depending on the size of the avocados used, the mousse will be more or less sweet each time you make it (unless you are able to find the exact same avocado size every time!). The chia seeds are optional yet add nourishing fiber and protein. They also aid in creating a thick texture. The best way to grind chia seeds is in a coffee grinder (and hey, if you add a little coffee flavor to your mousse that wouldn't be a bad thing!) or the dry container of your Vitamix. I’ve tried a mortar and pestle to grind chia seeds and it doesn’t work well. If you aren't able to grind the chia seeds, you may omit them or include them whole. Whole chia seeds will add a slight “crunch” to the mousse. Another option is to soak them in the coconut milk overnight before making the mousse for a smoother texture. Tip: when grinding chia seeds in a coffee grinder, grind more than you need and freeze for use in smoothies, oatmeal, granola, and future servings or chocolate-avocado mousse! The collagen is also optional, but it’s a wonderful addition for extra protein and gut-healing benefits. You cannot taste it at all, so it’s a great way to sneak it into your (or a loved one’s) diet. Looking for the creamiest dairy-free mousse ever? This is it! 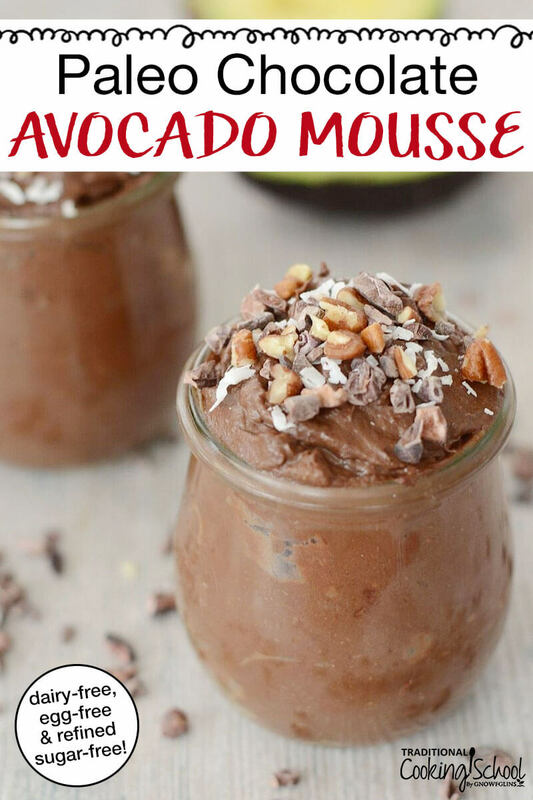 Naturally sweetened with dates, completely free of refined sugar, this eggless chocolate avocado mousse is so easy it takes a mere 15 minutes of prep. If it's not sweet enough for you, simply drizzle in some additional honey or maple syrup. With healthy fats like coconut milk and superfoods like collagen, this is a recipe to add to your Paleo desserts repertoire ASAP! Chop dates into large pieces then place dates and warm water in a small bowl or jar. Let sit for 10 minutes or until dates soften. Pour dates and water into food processor. Blend until smooth. Add remaining ingredients, except toppings. Blend until a smooth consistency is reached. Spoon into containers and refrigerate until cold. Serve on its own or top with nuts (pecans, walnuts, pistachios), shredded coconut, berries, whipped cream, cacao nibs, or whatever else your heart desires. What toppings will you use for this Chocolate Avocado Mousse? Could I use a different sweetener than the dates? I am afraid it would impact texture but I do not like dates. I didn’t taste dates at all in the final product. Very delicious in my opinion! I haven’t tested it without dates so am unsure. Swapping them for another sweetener would definitely impact the texture. I’m wondering if there is another dried fruit that could work in place of dates? Something that would add a similar texture and thickness. 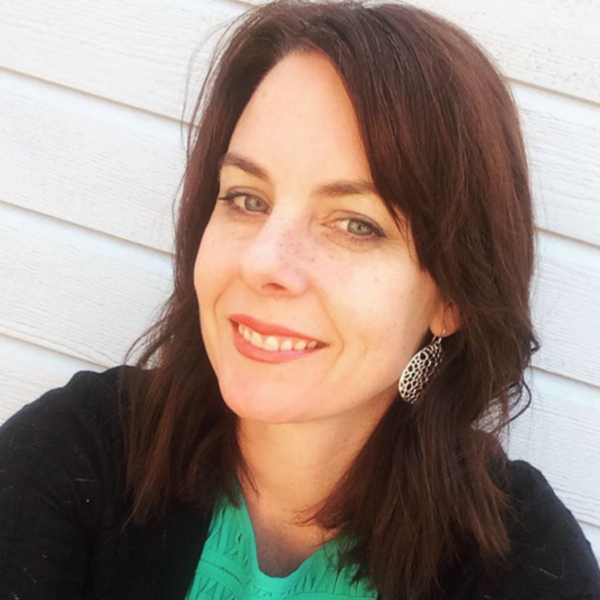 CAN I USE STEVIA OR MONK FRUIT INSTEAD OF THE DATES, DIABETES RUNS IN THE FAMILY AND I’M TRYING TO GO NATURALLY SUGAR FREE AND LOSE WEIGHT.